Mumbai: Air travel is set to be costlier as loss-hit local carriers, including state-run Air India Ltd, are planning to raise fares ahead of Diwali to encash on increased demand. Recently, top airline officials led by Jet Airways (India) Ltd’s chairman Naresh Goyal, Kingfisher Airlines Ltd’s chief executive Sanjay Aggarwal, IndiGo’s president Aditya Ghosh, SpiceJet Ltd’s chief executive Neil Mills and GoAir chief executive Giorgio De Roni met aviation minister Vayalar Ravi, seeking state intervention as their losses have been mounting. An executive with a private airline said it is yet to decide whether the suggested increase should be in the form of fuel surcharge or basic fare. The airline officials requested anonymity, citing the sensitivity of the issue. “The Indian aviation market continues to grow at an annual rate of 15%. However, all domestic carriers are incurring significant losses due to selling at 30% below cost," said a note presented by airlines to the civil aviation ministry. Mint has reviewed the note. The note said that domestic carriers, excluding Air India, are estimated to incur a loss of ₹ 2,400 crore on ₹ 9,800 crore sales for April-September, resulting in 25% loss of margin. Private carriers lost ₹ 2,800 crore on sales of ₹ 19,000 crore for fiscal year 2010-11, it said. “There is no other sector in India which is growing anywhere between 18% and 20% and bleeding at this rate. A price hike is needed considering the cost of operations," said an executive with a private low-fare airline. Anil Baijal, secretary general of the lobby group Federation of Indian Airlines (FIA), said the organization never discusses fares as a matter of policy. An Air India executive said the airline could adopt a different model in hiking prices. He said Air India never undercut prices. “Air India has a different business model and we cannot alter our model to the convenience of other airlines. Tickets are a perishable product and we are trying to achieve optimal utilization. The fares can be higher than low-fare carriers or even lower in some cases. It’s all about supply-demand situation," he said. Air India reduced fares by more than 20% in January and since the market is price-sensitive, other airlines were forced to match Air India’s fares, according to the note quoted earlier. Devang Bhatt, senior analyst with domestic brokerage Khambatta Securities Ltd, said all airlines are suffering from huge losses on account of high jet fuel cost. “To add to their woes, one of the largest carriers had dropped its fares to gain market share," Bhatt said. “Any price hike by airlines will improve the profitability of the carriers, considering the demand of this peak season." According to Bloomberg estimates, Jet Airways is expected to post a loss of ₹ 269.95 crore on sales of ₹ 3,734.90 crore for the September quarter. It had made a net profit of ₹ 12.40 crore for the September quarter in the last fiscal. 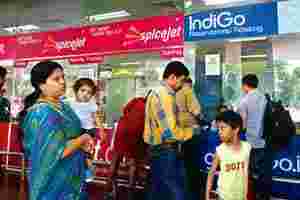 Bloomberg estimates SpiceJet to post a loss of ₹ 135.95 crore on sales of ₹ 866.70 crore. It had made a ₹ 10.11 crore profit for the September quarter of last fiscal. There are no estimates available for Kingfisher Airlines. It had posted a loss of of ₹ 230.82 crore loss during September quarter last fiscal. “Airlines are free to price their tickets and the government has no role in fixing the prices," aviation minister Ravi said, adding that no case of predatory pricing of air tickets by private airlines has been reported yet. According to Ravi, a working group has been set up under the chairmanship of Director General of Civil Aviation (DGCA) on regulatory framework to protect consumer interest, including the disclosure of tariffs and conditions of service by domestic airlines. DGCA had asked scheduled domestic airlines to display established tariff route-wise and fare category-wise on their websites every month and notify any significant and noticeable changes to the aviation regulator within 24 hours. A tariff analysis unit has been set up in DGCA to monitor air fares of domestic airlines at periodic intervals. The note to government said between last year and the current year, the costs have gone up by at least 30%, primarily due to a 40% increase in jet fuel price, landing and navigation, bank loan rates, etc. “Against this increase in costs, the average fares have actually reduced by over 10%."